Classic Record CDs Shop MyMusicFix!! Classic Records produces some of the finest audiophile LPs in the industry, and their reputation continues with these Limited Edition, Out of Print 24k Gold Audiophile CDs manufactured from the original master tapes using 20-Bit A-D technology. This is a true Collectorís find for those individuals who want to own the finest and rarest pieces of musical history. 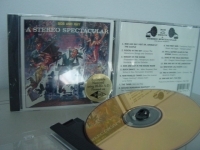 "Bob & Ray, Stereo Spectacular = Factory Sealed Classic Records Gold CD"
Classic Records 24K Gold CD. Tracks Include: "Bob And Ray Visit Dr. Ahkbar At The Castle" "Riders In The Sky" "Minuet On The Rocks" "Bob And Ray In The Round Room" "Buck Dance" "New-Fangled Tango" "The Thing" "Second Hungarian Rhapsody" "The first Noel" "We'll Gather Lilacs In The Spring" "Song Of The Volga Boatman" "Bob And Ray In The Laboratory" "Whatever Lola Wants" "The Ox Drivers" "Bob And Ray (The End)". "Sarah Mc Lachian, Fumbling Towards Ecstasy & The Freedom Sessions - Factory Sealed Double 24-Karat Gold CD Set"
"Sonny Rollins and Coleman Hawkins, Sonny Meets Hawk - CURRENTLY SOLD OUT"
Sonny Rollins with Coleman Hawkins (also on Tenor Sax) - piano/Paul Bley - drums/Roy McCrudy - bass/Henry Grimes or Bob Crenshaw. 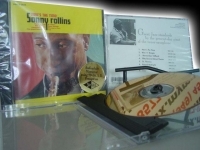 Sonny Rollins made several albums for the RCA label but SONNY MEETS HAWK is his best. This material which boasts one of the best mastering jobs on CD was recorded over three sessions in 1963. By this time, Sonny was beginning to explore some new outward directions in his playing. Coleman Hawkins came to this session with an open mind and his playing has never been more free. Just listen to their simultaneous solos on Summertime and the mutual understanding and cohesion are perfectly clear. 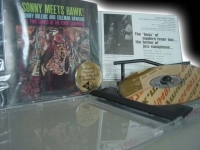 In all, SONNY MEETS HAWK is a classic meeting of jazz greats bridging the generation gap. Even more important is the shining example of the creative musical mind challenging itself to reach new levels of achievement. Songs included here: Yesterdays - All The Things You Are - Just Friends - Lover Man - At McKies. 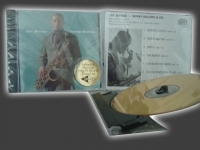 "Sonny Rollins, Now's the Time"
Classic Records 24K Gold CD. This Rollins recording is a rare treat, for never before has he perfomed on records a carefully balanced program of modern jazz classics. And, as always, Sonny has surrounded himself with first-class musicians who have their own contributions to these exceptional performances. Tracks Include: "Now's The Time" "Blue 'n' Boogie" "I Remeber Clifford" "Fifty-Second Street Theme" "St. Thomas" "Round Midnight" "Afternoon In Paris" "Four"
"Sonny Rollins, Our Man In Jazz"
Classic Records 24K Gold CD. As a whole the music on this disc uses a never-ending stream of varying tempos. There is a great deal of group interplay both during the themes and during the improvisations. The tunes, all either well-known standards or familiar Rollins originals, are given very convoluted and unusual readings. Tracks Include: "Oleo" "Dearly Beloved" "Doxy" "You Are My Lucky Star" "I Could Write a Book" "There Will Never Be Another You"
Classic Records 24K Gold CD. On this BRIDGE recording, Rollins makes a shattering return from sabbatical. He is joined by the youthful Jim Hall, who makes a great partner. The Bridge has many symbolisms (in his life, and literally as the 1600 ft bridge connecting the New York boroughs of Manhattan and Brooklyn), but musically the Album is a BRIDGE between Sonny Rollins who rose quickly to a position of top rank among the saxophonists of the post-bop era of Modern Jazz development in the fifties and the Sonny Rollins to be of the sixties. This Album is a historic moment in jazz. Tracks Include: "Without A Song" "Where Are You" "John S." "The Bridge" "God Bless The Child" and "You Do Something To Me"